, you can create a fairy kingdom in any corner of the house for your sweetheart. -This Princess Castle Play Tent is very easy to wash after kids spilled coke or chocolate milk inside. You can simply hand wash it in the bathe tub with a little dawn dish soap and warm water. 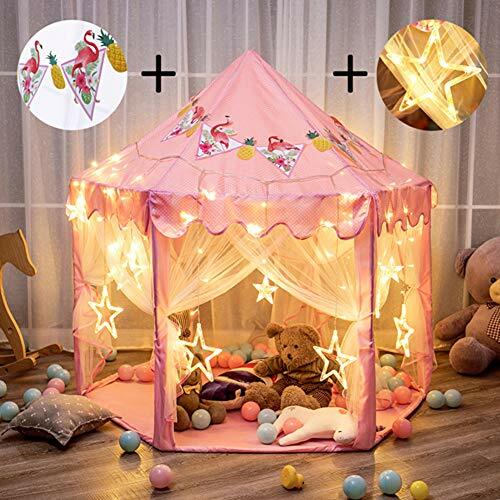 Cute Castle Tent: 55"x53" Large size solid fabric and soft mesh play tent providing a private and relaxed space for children, allowed 3 kids playing at the same time. Great Kids Gift: Every little girl has a princess dream, this fairy tale castle play tent help to come true your dream. Who does not like this little secret room? Extra Star Lights: Package with star string lights which perfect decor and light our high quality castle playhouse at night. Durable Rods: 100% premium plastic for prolong life. Easy to set up rods with other parts. View More In Seasonal Lighting.